If your child is going to be absent from school please ring the school between 8.15am and 8.50am, or send a note along to school with a sibling. The school office will ring you if your child has not arrived at school by 9.30am. This is a safety measure as we like to account for all our students each day. Attendance at school is compulsory for all children over the age of 6 years. We like to have an up-to-date contact number for parents or caregivers, and an emergency telephone contact number in case your child should have an accident and you happen to be out of the area for the day. If your child is on medication for any reason, please let his/her teacher know so that we can make sure that he/she gets the correct dosage at the right time. If your child becomes sick or injured, your child will be taken to the sick bay and arrangements made for the home to be contacted and the child to be picked up. If medical attention is needed for your child and we cannot contact either you or your emergency contact, the school will contact your family doctor, or the local Medical Centre. The whole school come together 3 – 4 times a term to celebrate and show the successes of our children. Assemblies are held in the school gymnasium and parents are welcome to attend. Prior notice of upcoming assemblies are given in the newsletter. Syndicate assemblies are held on a regular basis. Prior notice of upcoming assemblies and locations held are given in the newsletter. 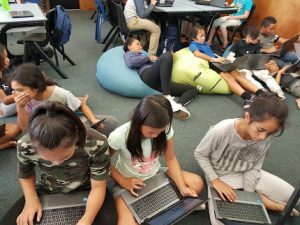 At Manaia View School we believe that every pupil needs to learn to take responsibility for his or her own behaviour and actions. Our Behaviour Management Programme is one of the ways we encourage our pupils to be responsible and choose to do the right things. 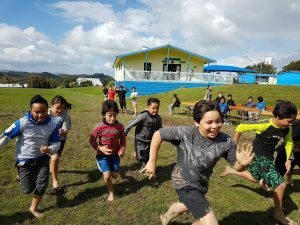 Each pupil at Manaia View School has the opportunity to be an active and contributing member of his/her “Syndicate”, earning reward coupons for excellent behaviour, positive attitude and outstanding academic and sporting achievement. These pupils are rewarded for their appropriate choices. We reward children who demonstrate excellent behaviour in the playground with our “Caught Being Good” awards. At school assemblies individual children are acknowledged for demonstrating our school values. Individual achievements in sporting areas or academic areas are acknowledged at either syndicate or whole school assemblies. Unfortunately, there are times when our pupils make choices that are not appropriate. Most of the time, we use our classroom management plans to ensure that pupils take responsibility for their actions. However, children’s inappropriate behaviour which continues or is deemed as very serious will see children put on the Social Skills programme. Bible is taught by volunteer teachers for 30 minutes once a week. If you would prefer for your child/ren not to be involved please send a note to your child’s teacher and the office. Manaia View School is proud to be a ‘Duffy’ School. The school works in partnership with the ‘Duffy’ Foundation, who sponsor books for every pupil in the school. The children choose from a list of books and are sponsored up to five books a year. Special ‘Duffy’ assemblies are held regularly where a well known role model visits the school, speaks to the pupils at a whole school assembly and presents the latest round of sponsored books. Prior notice of ‘Duffy’ assemblies are given in the newsletter. Children are not permitted to bring cellphones to school. Emergency contacts can be made through the school office. If a cell phone is confiscated from a child, parents or caregivers will be informed via a letter and will be required to collect the cell phone from the school office. Hopefully there will be few causes for complaint, however from time to time these arise. One or two points should be borne in mind regarding these. Often they arise due to misunderstanding, or because there is a ‘need to clarify’ some point. Others may be justified and require an explanation. Most often problems arise due to the fact that the parties involved in the dispute have not talked to each other and the complainant has got the information on which they are acting second hand, i.e. from misinformed students or from misinformation, which may be in the community. All complaints, which cannot be amicably resolved after the teacher concerned has been consulted, should be referred to either the Deputy Principal or Principal. Appointments to meet with any member of staff need to be made through the school office. Students who choose to ride to school are expected to obey the Road Code as well as wear a safety helmet at all times. Cycles need to be parked in the cycle stands in front of the school. Cycles are not to be ridden in the school grounds at any time. Children riding cycles under the age of 10 need to be accompanied by an adult. Cycles with a wheel diameter of more than 35cm must be ridden on the road. We have the mobile Dental Clinic park on site and this is staffed on a rotating basis. The children are checked once a year and treated if necessary. We encourage all parents of children who are approaching their 5th birthday to come along to school and arrange some pre-visits, so that the children feel more comfortable when they do start school. Parents are required to stay with their child during pre-visits. An enrolment form will need to be completed and given to the office when your child starts school. If this is your child’s first school, you will also need to bring their birth certificate. When you are enrolling a new entrant, you will also be asked to complete a health form. Manaia View School is proud to be a ‘Smoke Free’ School. Each child is expected to do homework during the school week. Expectations will be outlined by your child’s teacher at the beginning of the year. If your child arrives late to school - that is at any time after the 8.50am bell, your child needs to report to the school office for a late note. Students are encouraged to borrow books and your help to see that the books are treated well is appreciated. Students are able to borrow up to two books at a time for two weeks and your help in seeing that the books are returned on time is also appreciated. Your class teacher will notify you as to your child’s library day. There is also a Parent and Toddler section within the library. A card will be issued to parents interested in using the school library for borrowing purposes. Students are asked to name their belongings, as it is very difficult to determine what belongs to whom. Lost property is kept for inspection in the photocopier room opposite the school office. It is also periodically displayed outside the library or in the gym. Parents are invited to inspect the lost property at any time. All unclaimed property is disposed of at the end of each term. These are given to the oldest or only child attending the school. They are sent home throughout the term and are an excellent way of keeping up to date with school events. At other times small memo notes are sent home for special events. The first newsletter each term is posted home. This is encouraged and welcomed. Parent help may take the form of working in class and assisting children, helping in the resource rooms, the library, photocopying or assisting with school resources. If you feel able to contribute in some way please contact your child’s teacher and the office. During the year, the school invites visiting performing artists to entertain the students. 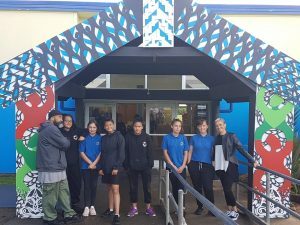 Whilst the school endeavours to cover the cost of these performances, a koha is required. Class photographs are taken once a year by a professional photographer. This is usually undertaken in the 3rd or 4th term. Order forms are sent out prior to the photographer visiting and you are under no obligation to buy. During the year you will have the opportunity to meet the teacher formally for an interview. The purpose of these interviews is to set goals as well as report on progress, students are encouraged to attend. Written reports are sent home towards the end of the 4th term. All New Entrant 5 year olds get their stationery provided free at Manaia View School, and all other children receive subsided stationery. All visitors to the school must report to the office to sign in as soon as they enter the school. It is expected the visitors wear an identifying name badge and sign out when they leave the school.